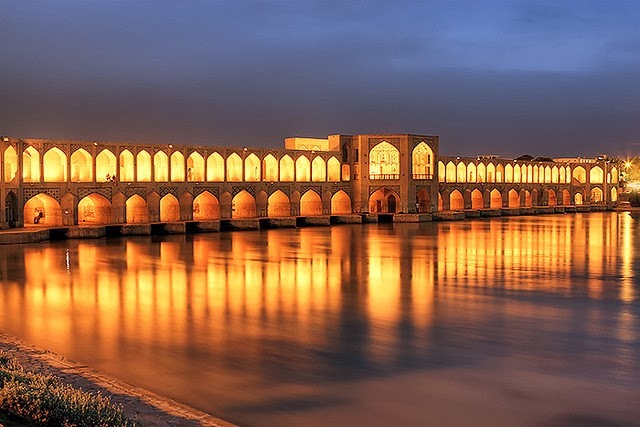 The Khaju bridges performs many functions the first most obvious one is connecting the two banks of the Zayandeh River. At the same time it works as a dam that separates two portions of the river with different water levels. The pass way of the bridge is 7.5 meters wide and is also made of bricks and stones with 22 larger and 27 smaller inlet and outlet channels. The pieces of stone used in this bridge are over 2 meters long and the distance between every channel and the ceiling base is 21 meters. The existing inscriptions suggest that the bridge was repaired in 1873. Khaju was originally decorated with artistic tile work and paintings and served as a tea house. In the centre of the structure, a pavilion exists inside which Shah Abbas would have once sat. Also in the centre of the bridge on both the down and the upstream sides there are vantage points which give the visitors remarkable views. The bridge is an arch bridge and thus does not need cables or additional supports. It is a semi-circular structure with abutments on each end part of a structure that bears the weight or pressure of an arch. It also served a primary function as a building and a place for public meetings and it is good place for the visitor. In 2008, the Khaju Bridge, described as one of the world's great multifunctional bridges, made the list of the world's 10 most amazing bridges at number nine. In addition it is one of the most historical and interesting places you can visit in a country which has more than its fair share of historic and beautiful monuments.